Immediately before and to the right of C Redoubt are the remains of a trench which runs upwards from the gully on to Fir Tree Spur. This is Frith Walk, a major communications trench to the front lines. 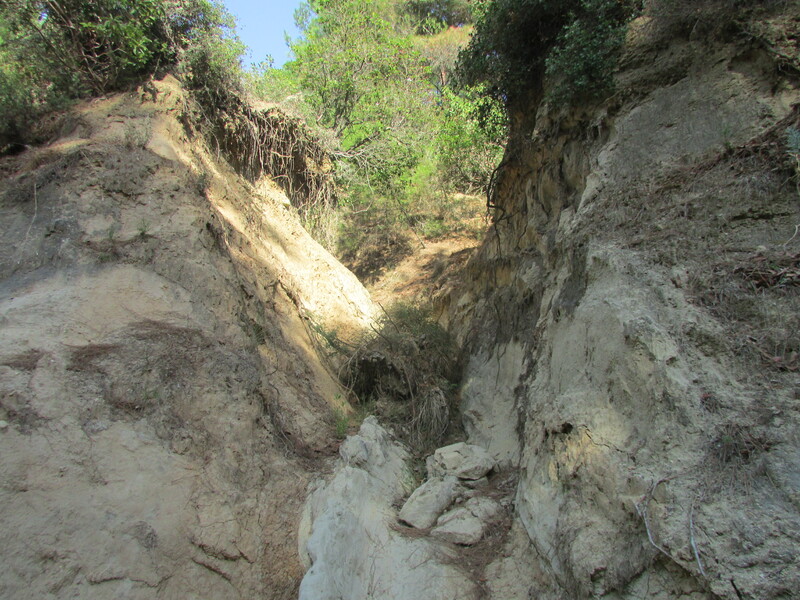 Today, over 100 years of rain and erosion has filled the trench in, so that the level is now well above the gully floor. Apart from the area around the treeline along the clifftop of the ravine, Fir Tree Spur is now largely ploughed fields. This means that many of the old trench lines have been lost, but the entrances to the ravine of a number, such as this one, still remain. I have yet to do the detailed research, but it seems reasonable to assume that Frith Walk was named after Brigadier General C H Frith, who commanded 125th Brigade, The Lancashire Fusiliers, at Cape Helles. The Lancashires were heavily engaged in actions on Fir Tree Spur, to which Frith Walk leads. It is possible, with care, to climb into Frith Walk and to follow it (or at times, the verge just above it) up to Fir Tree Spur and on to the open land. In doing so one is walking up to the front line on the east of the gully, in the footsteps of hundreds of men, many of whom still lie beneath the fields with no known grave. This is a useful route out of the gully if you intend to visit the locations of the Boomerang and Cawley’s Crater on Fir Tree Spur.